This figure shows the total number of articles in the New York Times, Los Angeles, Times, and Wall Street Journal that mention homosexuality in some way. 1990 marks a huge increase in the annual coverage of homosexuality, doubling the previous year’s coverage. 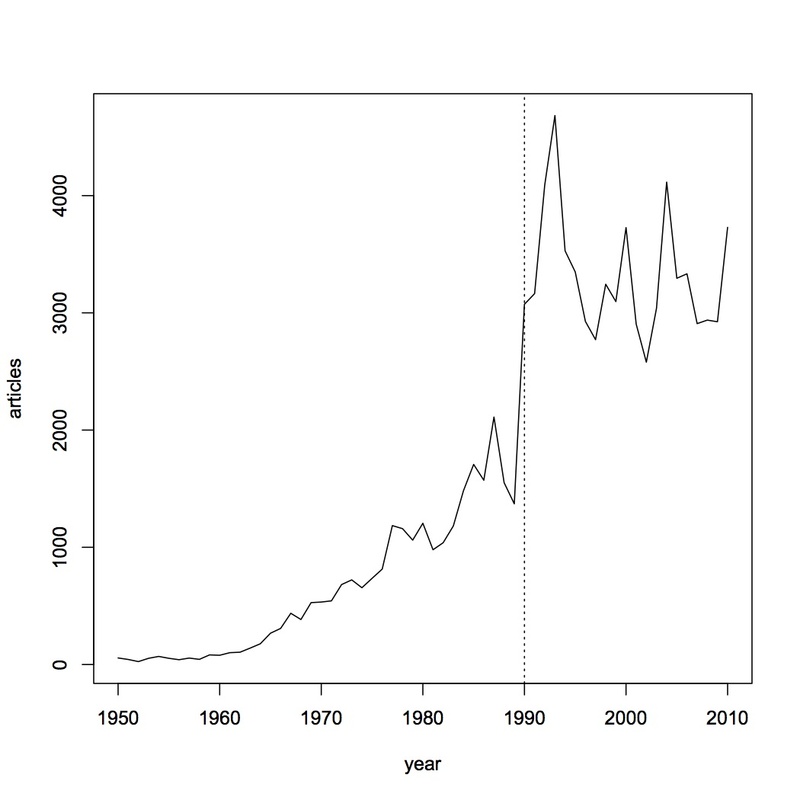 The next figure shows the proportion of articles using gay versus homosexual in each year. Using gay rather than homosexual was an early goal of the gay rights movement, as homosexual was seen as too clinical, and the term gay to mean homosexual originated from within the movement, rather than being ascribed by psychologists who viewed homosexuality as a mental illness. Again, 1990 marks the point at which gay becomes more prevalent than homosexual. 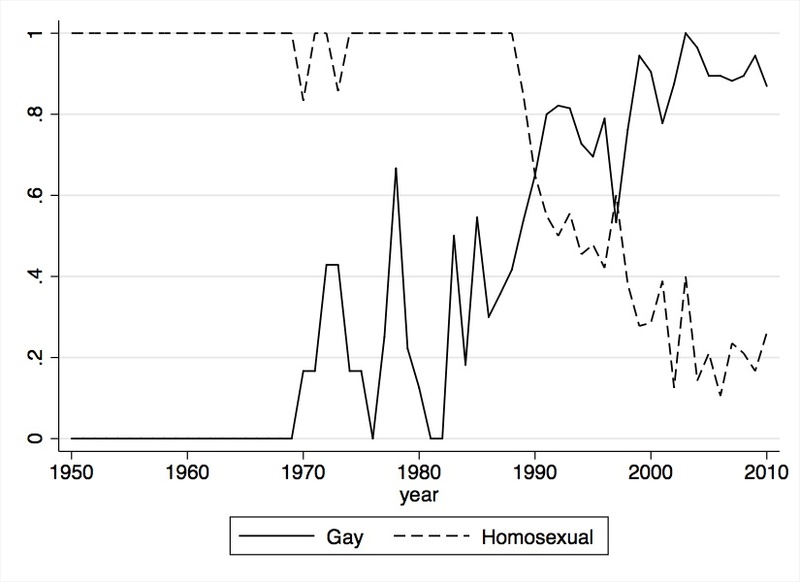 I can get even more detailed, looking at when gay or homosexual is used exclusively within an article. 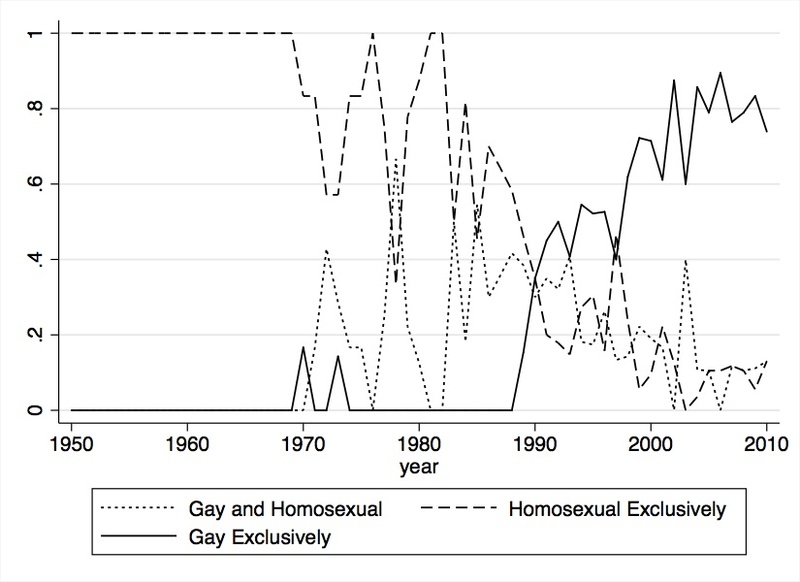 The next figure graphs the proportion of articles using gay or homosexual exclusively. 1990 appears again as the crossover point at which exclusive use of the term gay dominates over the use of the term homosexual. Finally, there’s data I am in the process of coding. I’m coding for the presence of any of twelve claims, six positive and six negative, about homosexuality. The following figure graphs the proportion of positive and negative claims over time, with a moving average smoother applied. I’ve only coded through 1992, but even this limited data suggests 1990 as a turning point. So what happened in 1990? Not much, really. At least, nothing that is recognized today as major breakthroughs in gay rights. There were two federal laws passed that had an impact on gay rights. The first was an immigration reform bill that removed homosexuality as a possible reason to ban someone entry into the country. However, this hadn’t been enforced in years – the Reagan administration in the early 1980s instructed immigration agents that barring someone entry solely because of homosexuality was no longer good policy. The second bill was the Hate Crimes Statistics Act, which instructed the FBI to collect data on the incidence of hate crimes on the basis of, among other things, sexual orientation. This is perhaps the first time a federal bill included the words “sexual orientation,” however a section two was added that made it clear, in no uncertain terms, that the traditional american family was the corner stone of society and this bill was in no way supporting or encouraging homosexuality. Neither of these laws have stayed in the collective consciousness of the LGBT movement. So I’m inclined to think it’s something else. Maybe its AIDS. 1990 was the middle of the AIDS crisis in the United States. 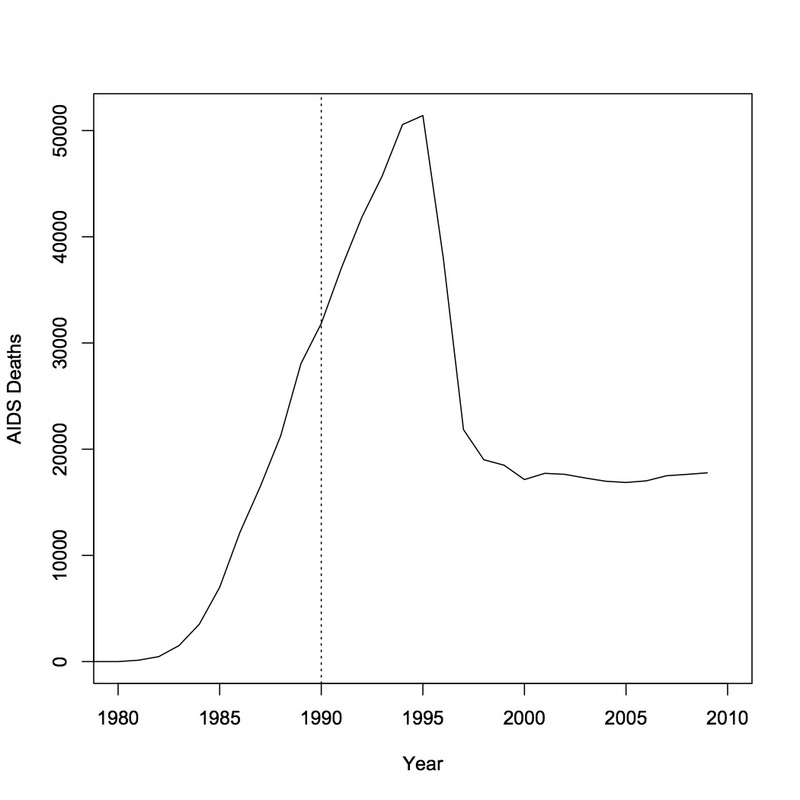 Perhaps there was a large bump in AIDS related deaths, or a shift in the demographics. But no, there was no major shift in the number of AIDS related deaths. Nor was there a major shift in the demographics. 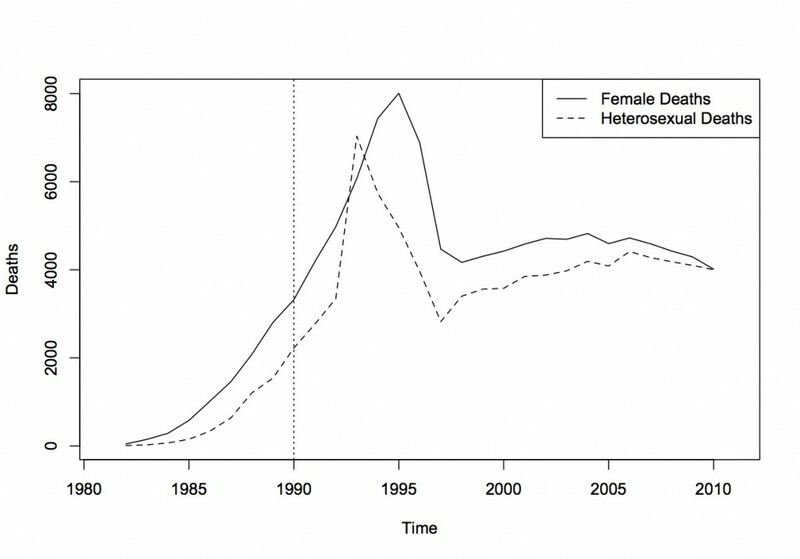 Women still only made up 10% of AIDS deaths in 1990 (they would eventually comprise 30% of AIDS related deaths), and the number of deaths of people who contracted HIV from heterosexual contact was even less. Perhaps there was a shift in public opinion? This could be promising, but the data is inconclusive. 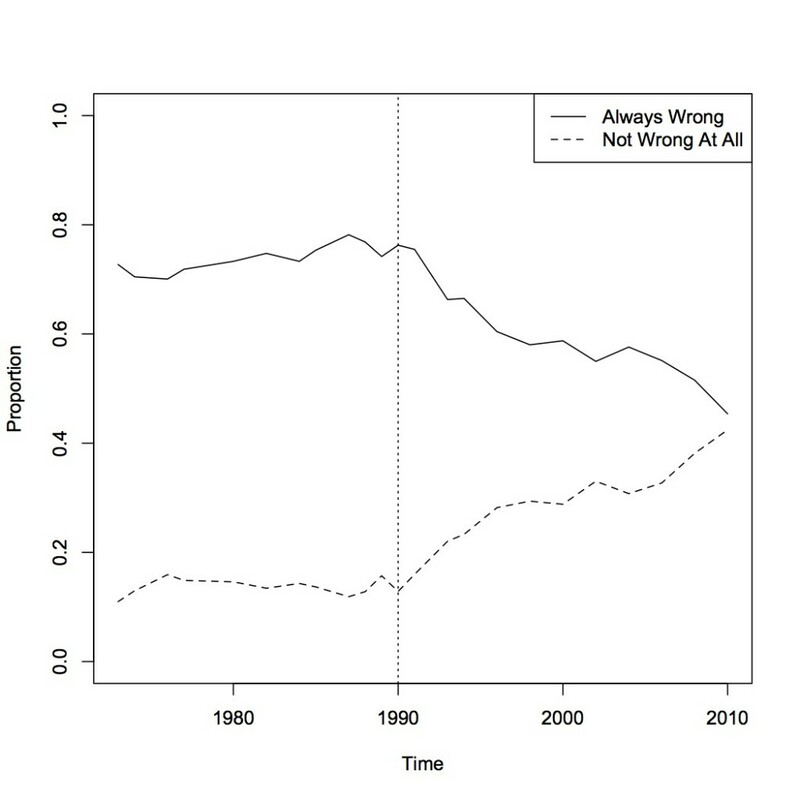 GSS asks whether homosexuality is wrong, and there was no shift in the responses until after 1990, though 1990 is, again, marking the turning point. Gallup has asked whether homosexual relations between consenting adults should be legal or illegal. 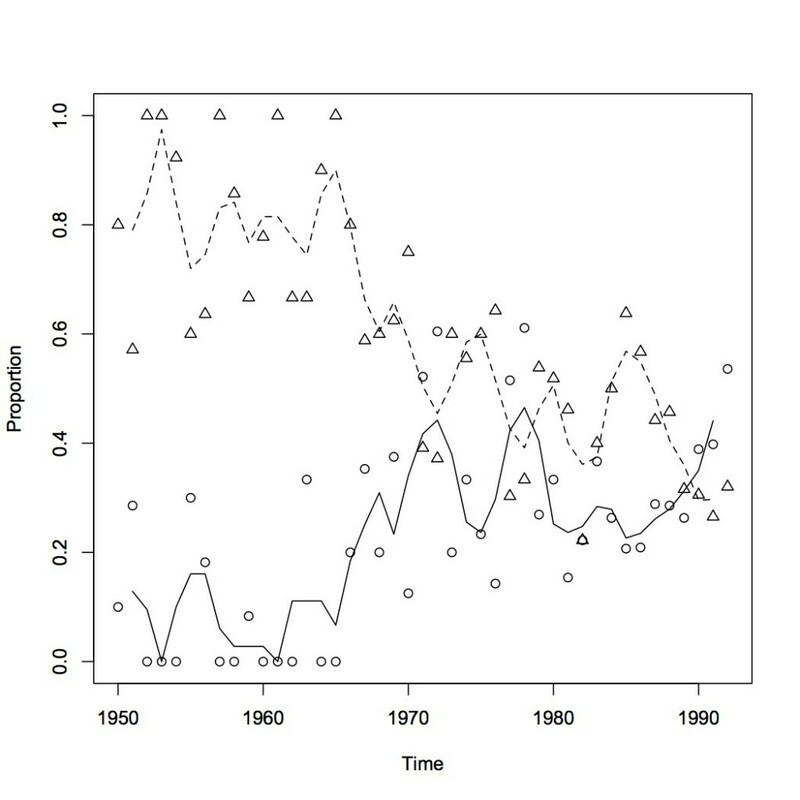 This data is much more variable than the GSS data, and there is a shift prior to 1990, but it appears to be a correction to the shift in public opinion caused by Bowers v. Hardwick in 1986, so I don’t know if this represents a true, fundamental shift in public opinion, or just an artifact of the supreme court decision. I’m inclined to believe the latter because gallup’s data flatlines for the next decade or so. So what’s happening in 1990 to cause such shifts in the tone of coverage of homosexuality in mainstream newspapers? What is the mechanism? I don’t know yet, but it presents an excellent puzzle for my dissertation. This entry was posted in LGBT Movement by Thomas. Bookmark the permalink.